The Great Ocean Walk is our most iconic coastal walk, for good reason, as it traverses one of Australia’s most dramatic coastlines from Apollo Bay to the Twelve Apostles through the Great Otway National Park. The 104 km walk meanders its way through Manna gums with koalas only a few feet from the track, to traversing massive sea cliffs, cliffs that have made this location famous. You’ll walk through giant Mountain Ash forest, beneath the tallest flowering plants in the world and on along some of the most remarkable pristine beaches in Australia. There are plenty of days when the ocean’s azure sparkle looks spectacularly inviting, but when you witness the awesome power of the Southern Ocean’s eternal tidal assault, you’ll see why this coastline is known as the Shipwreck Coast. There are also ample opportunities to spot wildlife in their natural habitat, ranging from kangaroos, wallabies, echidnas and koalas to black cockatoos, sea eagles, wedge-tailed eagles, dolphins and whales. Highlights include the 12 Twelve Apostles, plus more stunning views as you progress along the track at Castle Cove and at the Gables, as well as Wreck and Johanna beaches. This is some of the most remote and remarkable terrain you’re likely to ever navigate. The pristine nature and deafening surf make Johanna Beach one of the ultimate beach walks. 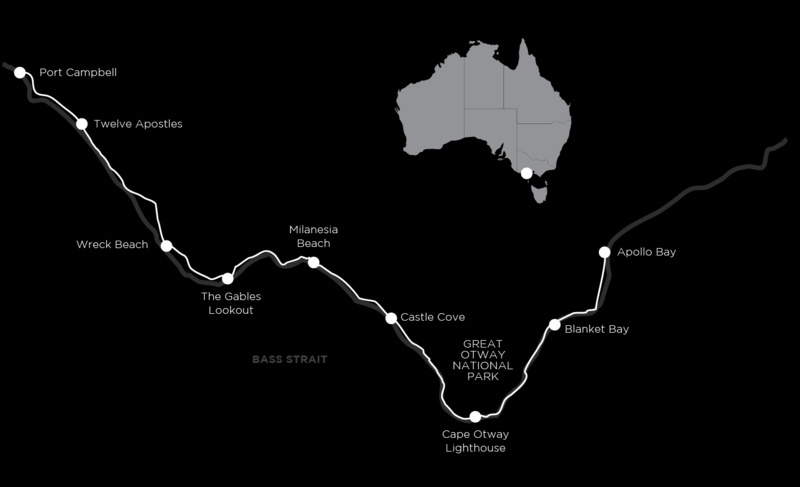 The Great Ocean Walk is also available as a 7-day group-guided walk or a shorter, 5-day highlights self-guided walk. Start in Apollo Bay, on the Great Ocean Road any time after 2 pm. Optional afternoon walk to Mariners Lookout for panoramic views over the ocean and Apollo Bay village. Leave the tourists behind as you begin the Great Ocean Walk along the coast away from Apollo Bay. The track hugs the coast at first before heading inland through tall eucalypt forest and patches of rainforest. Wildlife here is abundant and this is an excellent day to spot black wallabies and more along the trail. The walking finishes at delightful Blanket Bay – an ideal place for a swim. From Blanket Bay, the track contours through coastal forests and along the clifftops to Parker Inlet – a picture-postcard setting. An optional side-trip to Crayfish Bay is also a highlight. The track continues through Manna gum forests that are home to large numbers of koalas, eventually emerging at Cape Otway Lightstation. The afternoon is free to explore the lighthouse, museum and displays or spend time at the eco-lodge. On to Station Beach and an optional short trek to pretty Rainbow Falls where a spring cascades down to the rocky coastal platforms below. The track continues through the wind-sculpted sand dunes and along the clifftops to the Aire River estuary and wetlands. Stunning coastal scenery awaits on the route to Castle Cove. Today’s section of the Great Ocean Walk has some of the most spectacular coastal views of the entire track. It’s also a great day for wildflowers with colourful heathlands and numerous grass trees. In the winter months, there are native orchids and masses of pink heath – Victoria’s floral emblem. Another highlight is the long, white, sandy expanse of Johanna Beach. Milanesia Beach is one of those secret beaches not many people get to – and what a special place it is. From here the track continues along the clifftops and you can see all the way back to Cape Otway Lighthouse. High sea cliffs, breathtaking views and coastal forests lead you to Moonlight Head. The first highlight today is The Gables Lookout, perched on one of the highest sea cliffs in mainland Australia. This is a superb spot for whale watching between June and September. Continue through a grove of casuarinas to Wreck Beach where the remains of two shipwrecks can be inspected. The Great Ocean Walk finishes at the impressive Twelve Apostles, a group of limestone sea stacks that are constantly changing. At the end of the walk, celebrate your achievement without having to worry about travelling back to Melbourne this evening. After breakfast, you will be transported back to Apollo Bay (if you arrived by car) or to Camperdown for public transport connections. The Great Ocean Walk is well graded and relatively easy to negotiate. Full days walks average about 18km. There are great opportunities for fit walkers to challenge themselves with options to increase the walking and on two of the days where we walk over 20km. Great Ocean walk end to end. All of the accommodations are more than comfortable and all rooms have ensuites. Your first night will be spent at a comfortable property in Apollo Bay. Then it’s on to Castle Cover where you will either be at the Great Ocean Eco Lodge or the historic Cape Otway Lightstation. Both properties offer something a little extra, an opportunity to learn all about the conservation efforts at the Eco Lodge on a guided evening walk or the exclusive use of the Lightstation’s environs are special starts to your walk. Travel down on the Great Ocean Road to the start of the walk. You don’t have to arrive early in the morning on your first day. We include accommodation for you in Apollo Bay the night prior to your walk so that you can start the walking feeling refreshed after a great breakfast and a picnic lunch in your day pack, ready to go. Each day we move your luggage ahead for you to the next accommodation. All you need to carry is a daypack with what you need for the day. We provide comprehensive walk notes for you. It’s easy to find the way on this track but with our notes you’ll also receive lots of information to help you better appreciate the flora, fauna, history and geology you’re experiencing along the route. We’ve mapped a point-to-point walk to maximize the highlights, staying in different accommodation on the route. This means more variety, less backtracking and time spent in a vehicle and more time to relax at the end of the day. You’ll walk an average of 15–16 km each day, with some optional side walks for those wanting to extend themselves. The walking terrain is varied following clifftops, wide forest tracks, rough trails, beach traverses, including Wreck Beach, shaded forest canopy. It’s mostly relatively easy going, flat stretches, some steady, challenging climbs and long downhill descents. The walk is moderate to challenging with some longer days. This is a great opportunity for fit walkers to challenge themselves. December through February is usually warm to hot with excellent swimming weather. Book well in advance for January due to the summer school holidays as the Great Ocean Road walk gets very busy. March through May is usually cooler, with long sunny days, perfect for walking. The winter months (June to August) are cool and sometimes stormy, providing exhilarating walking along the beaches. In winter, the hills are covered with pink heath, Victoria’s floral emblem. September and November are usually cool to warm and this is when most of the colourful wildflowers appear. We strongly recommend purchasing a travel insurance policy for the as we charge a cancellation fee if you cancel your Great Ocean Road walking holiday after we have confirmed it. We offer a 30% discount on travel insurance booked via our website. Get an instant quote and purchase online now.